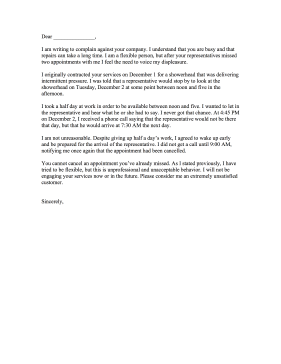 Professional lapses in etiquette can be addressed professionally with this missed appointment complaint letter. I am writing to complain against your company. I understand that you are busy and that repairs can take a long time. I am a flexible person, but after your representatives missed two appointments with me I feel the need to voice my displeasure. I originally contracted your services on December 1 for a showerhead that was delivering intermittent pressure. I was told that a representative would stop by to look at the showerhead on Tuesday, December 2 at some point between noon and five in the afternoon. I took a half day at work in order to be available between noon and five. I wanted to let in the representative and hear what he or she had to say. I never got that chance. At 4:45 PM on December 2, I received a phone call saying that the representative would not be there that day, but that he would arrive at 7:30 AM the next day. I am not unreasonable. Despite giving up half a day's work, I agreed to wake up early and be prepared for the arrival of the representative. I did not get a call until 9:00 AM, notifying me once again that the appointment had been cancelled. You cannot cancel an appointment you've already missed. As I stated previously, I have tried to be flexible, but this is unprofessional and unacceptable behavior. I will not be engaging your services now or in the future. Please consider me an extremely unsatisfied customer.